Selling products has, of course, become a bit more difficult than usual these days. No wonder then that companies everywhere are turning to optimistic marketing messages in an effort to counteract the steady drum beat of negativity coming from front page headlines around the globe. Many sales executives have drawn the same conclusion: What better poster child for hope than US President Barack Obama? There are Obama dolls, Obama T-shirts, Obama soap-on-a-rope. There is even Obama thong underwear on offer. Not wanting to miss the boat, a German food company has now gotten into the act. 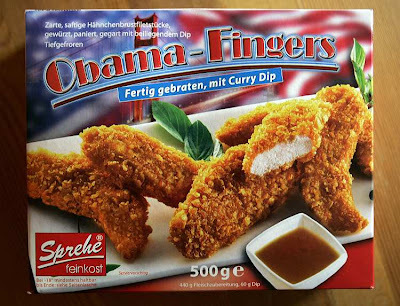 Sprehe, a company that has all manner of frozen delicacies on offer, has come up with a new product it calls “Obama Fingers.” Far from being real digits, though, the “fingers” in question are “tender, juicy pieces of chicken breast, coated and fried,” as the product packaging claims. Fried chicken, in other words. With a curry dip. Want more dish? Sign up for Spiegel Online’s daily newsletter and get the best of Der Spiegel’s and Spiegel Online’s international coverage in your In-Box everyday.